A new animation app/feature would be extremely useful, and greatly appreciated. Features such as frame by frame animation are currently supported by the Adobe Suite of products, but are not apparent in Affinity apps, which may deter some potential customers, of which there are many. I, myself, preferred the Affinity suite of apps instead of other ones because of the more intuitive and better-looking interface, the price, but mostly because it was a pay-once purchase, not a subscription service. I was disappointed that animations were not supported, although it was not extremely important to me, but to others, animations could be a must-have, turning them away from Affinity. Affinity(products) is already great, and a cheaper, more-friendly alternative than some other products offered on the market for students(like myself), designers, photographers and more, but an animation feature would make it even better. Fully agree to this one. After two weeks of testing, I've just purchased Photo and Designer and I love it on the one hand, but on the other hand I'm often working on frame animations. Some kind of timeline as you guys probably know it from Photoshop would be a great feature - or, as Henry said, make a new app for that. I know that's not done overnight, but that could be the next big thing once after you've finished Publisher. Animations are not a niche. Anyway, looking forward to see you guys moving to the top. Keep it up. have you thought about using Motion app? The devs know I've been making the suggestion repeatedly regarding an "Affinity Animator" app, so I'm not going to beat a dead horse here. Instead, please allow me to offer some suggestions for apps that may be used while we're waiting for Animator. HitFilm 3 Express: Free, www.hitfilm.com/express HitFilm's big brother, HitFilm 3 Pro, is the lower cost challenger to After Effects. HitFilm 3 Express is the free entry-level version of HitFilm that can be expanded with plug-in packs that range in price from $10 to $100. It does come with some decent base fx, but if you're looking to create fx like you can in Motion, the atomic particles pack is a $100 additional investment. Natron (pronounced like "matron") is a compositor that has an interface very similar to Nuke and can do motion graphics. It is also open fx friendly and will accept most plugins (commercial & open) built under that architecture. As a suggestion, use the snapshot builds. These are the betas of version 2 and have much more functionality than the stable builds. For example, the snapshot has a dope sheet, the stable build does not. BTW, in all of the free packages I outlined above, the process from Designer would be to export your assets as PNG files w/alpha channels. HitFilm and Natron do not accept any vector graphics at this time. Wow, I have actually never heard of Motion before! I checked Apple's website on this, but it doesn't look that promising- Not many upgrades, more dependence on Logic Pro, and it looks a bit more like a side project for Apple. But anyways, I might use it if I really needed to, thanks for the suggestion! Also, couldn't the AF team use the keyframe animation features in DrawPlusX8, and import them to the Designer app? I second what is said and I have Motion and it is good for what it is meant for; Motion graphics, but rather clumsy for classical 2D animation, something I want to work more with as I am full of ideas, but I have struggled uphill the steep learning curve of Toon Boom's products and althouth their latest Harmony Essentials is a step forward in the right direction, it is not there. As a cartoonist and illustrator I think 2D animation will be more and more important as we are moving from print to the web. 3D may be good for film etc. but 2D has a future as one can create much lighter animations and like animated illustrations, for instance. Animated ads. There are no limits. But what I want to see is an animation app for us who actually draw. The problem with everything I have tested so far is that they feel like mobile phones before the iPhone and mp3-players before the iPod. They do the job but they are clumsy and unintuitive. I have tried to create multilayered files with Affinity Designer to import them with layers intact into Harmony, but so far I haven't succeeded. Seems like the PSD-files need to handled in Photoshop to transform the layers into folders - and then you need the full version and no thanks. And why? Why can't the software do that for you? Creative software should remove all the hoops and loops, hurdles and obstacles and tedious tasks and let us concentrate on what we can, create. I am not a developer and neither do I need an animation software which resembles old time analogue animation studios. It is difficult to put it down exactly what I am looking for but Affinity Designer is to me the iPhone of vector design, something which I have struggled with during many years as well. After a few days with Affinity I am able to throw together illustrations very fast and keep the deadlines although I am procrastinating. If the people at Serif could do the same for animation, it would be like entering heaven! You could start by adding simple timeline animation to Designer, but I think it should be developed as a standalone app. Supporting multilayered files from Designer and Photo. And it is simple. Let the software take care of the tedious tasks. Make way for creation. Can't be that difficult? :D Hahaha! Sorry. Well, good luck! Here's to hope! There is Fusion 8 & Blender as well for other 2D animations. As for Zbrush it is way above my budget and the other is Windows-only. And subscription. No, I am still of the opinion that 2D animation software today is like mobile phones were before the iPhone. Serif seems to have the right approach. Hope they or someone else with the same appraoch are busy working on it. It’s not that hard as you think. 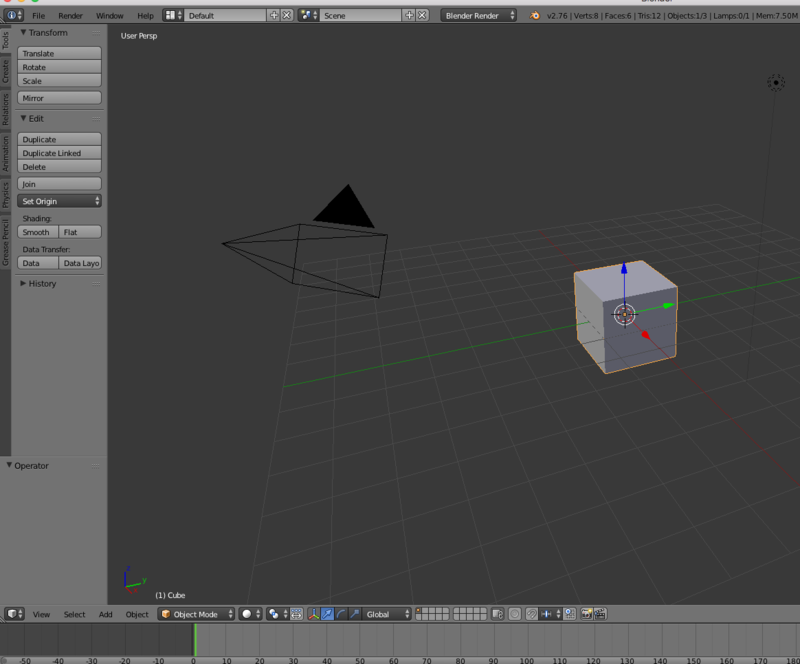 Speaking of Blender, I realised that my version had to be old but just look at that GUI. That is an engineer's GUI and not an artist's. How on earth am I supposed to work with something like this? What does it mean? Bounds? TexSpace? PassIndex 0? DupliVerts? Where are my drawing tools? So I downloaded the new version and it was a tiny improvement, but still - how do I get that 3D thing away? Just a couple of horror examples on how a creative user interface should not be. When I see something like this, I feel like storming into wherever the developers of this are working and throw a laptop at them and tell them to get real! TexSpace? = Texture Space = What rules are used to place 2D textures on some 3D object. PassIndex 0? = Pass refers to the render for a layer that might be used reflections, one for basic color, one for shadows etc. -> Index is just a number that indicates to the software which pass or material you are referring about. Where are my drawing tools? -> Those would be in the paint mode + in case of the grease pencil animation addon in the left viewport panel where the grease pencil tool is located. 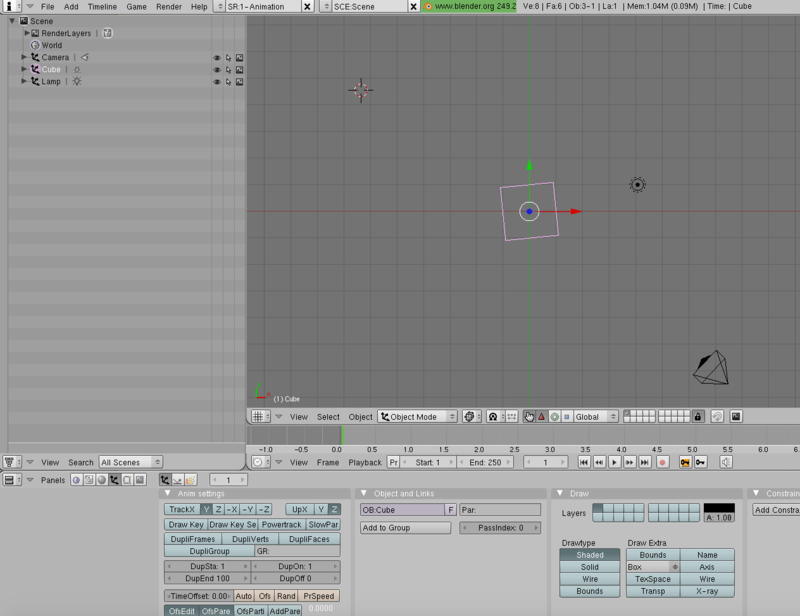 Now I can agree that Blender UI is not the best out there, but it’s not the worst either. C4D & MODO UI’s are definitely more beginner friendly but once you gain more experience one will see they have serious issues of their own as well. Autodesk Sketchbook Pro 7. It will only allow you to do a flipbook @ 1080p max. I think it will only allow you to make an animation of 10 seconds @ 24fps but it will give you something to work with that will allow you to export the frames as .PNG files. It also includes onion-skinning and coloring of artwork. Adobe Photoshop. With the CC versions (or the CS5/CS6 Extended versions), I've been told that you can draw and do your own in-betweening using it's animation palette. Adobe Flash. While you can't draw in Flash. I have seen tutorials wherein animators have done their drawings/in-betweening in Photoshop and saved the frames out to PNGs and imported them into Flash to run the animation and export the video files. Synfig Studio. Synfig Studio will allow drawing although it's main strength is to create animation of vector drawings without the user having to do all of the in-betweening. Pencil2D. Reminiscent of Sketchbook Pro's flipbooks. Full drawing workflow. In beta. Blender. In the Grease Pencil mode, it is possible to accomplish hand-drawn, 2D animation. Examples of all of these softwares being used for creating 2D animation are available for viewing on youtube with a search. I didn't see it mentioned here so far in this thread but TVPaint is worth a look for doing hand drawn 2D animating digitally. I don't know what budget you have/can justify but I should say it doesn't come cheep. Still, might be worth you looking at it. You forgot to mention ToonBoom Studio (https://www.toonboom.com/products). Not free but they have different packages for different needs. I've always wanted to give ToonBoom a try but unfortunately in my line of work, animation isn't needed and so I've never had the chance to try it but hopefully one day I will. Wow Markw, TVPaint is expensive! I have Toon Boom Express, Toon Boom Studio 8.1 and Harmony Essentials, all from ToonBoom and although I cannot say I have worked extremely hard to learn it, I have given it some serious attempts over the years. The problem is partly that I am used to dive into a programme, doing some easy stuff to begin with and then learn as I move on. With ToonBoom's offerings, I find that difficult. To my experience I need to study hard only to get the easiest things done. Essentials is a great step forward in the right direction, but as I see it it still has a way to go. The reason why I posted my comments here, is because I used to have the same problems with vector-based illustration, only not that tough, though - but with Affinity Designer all that trouble vanished into thin air like a wisp of smoke. Somehow, they have just got it right when it comes to intuition. I'd like to see that done with 2D animation, as well. I know that you can create 2D in 3D as well, but I am not interested in 3D. Adobe Photoshop is above my budget and so is TVPaint. I have tried out Synfig, Pencil2D and Blender and there are some promising steps there, but it is not quite what I am hoping for. The first item on my wishlist is that the app must give the user the possibility to create something simple right from the start. Be it stick animation or whatever, but aside from understanding the principle of animation (which in short is the same as the principle behind motion pictures or movies - successive frames), it shouldn't require much. The second item is to have a full toolkit of drawing tools. And it should be built with drawing in mind, for artists who know how to draw. The third is that in spite of the apparent simplicity and intuitive approach it should be advanced; i.e. that you learn as you go. Photoshop worked that way for me and now Affinity Designer does and I can't see why a 2D animation software couldn't do the same. There is also Anime Studio (used to be called Moho), which is actually a pretty cool program for 2D animation if you don't like the more traditional approach of the difficult to learn programs rooted in traditional cel animation like Toonz Harlekin (though The TAB might be of interest to you), ToonBoom Harmony, Animo, RETAS Pro and so on. Anime Studio also has some features borrowed from 3D programs, such as support for bones and basic 3D and is thus suited for a wide variety of animation styles. It's quite a bit easier to pick up than most other animation programs and is a bit more flexible. There are also lots of tutorial videos you can watch, but there is of course always some learning curve involved. This software also looks very much worth following. It takes a more traditional approach, but apparently it is not a reality yet after the crowd funding did not come together. The mockups look great, though. Blender, while not exactly pretty and despite a few major quirks, is actually currently one of the cleanest interfaces of a 3D program of this complexity out there. Modo could be considered another. But if you wanted to use a 3D animation package, you would always have a major learning curve ahead of you if you want good results. It's not something you can pick up just by experimenting with the software like you say you like to do, just due to the sheer complexity of the task, and the way of working is nothing like the process for 2D animation. SketchUp is the closest thing to a 3D program that you can pick up yourself as you go along, but it's no good for animation. As far as an Affinity-based animation program goes, that actually sounds like a great idea. Currently, there aren't many good tools out there for web animation (SVG etc.) and interactivity. There used to be Macromedia Director, which was great for animated UIs and interactivity (not so good for actual 2D animation, which most people used Macromedia Flash for, which also wasn't that great for traditional animation), but it seems like Director was discontinued and Flash is no longer very actively developed either. It's kind of a shame since Director's approach would have been perfect for instance for bringing static print publications into digital form (compare that approach to how cumbersome it is to even create basic animations in InDesign). Unfortunately Director never received standard-based output features for the web and went out of style alongside interactive multimedia CD-ROMs. I think the combination of real animation features (something you could make an animated film with, based on vector and raster tools already found in Affinity) and interactivity for web and screen would be a very appealing product. Sort of like a modern equivalent to Flash and Director, but without the bloat and quirks and with output based on SVG and/or HTML in addition to serious traditional production tools and output formats like rendered video. But yes, I agree with you that seeing what there already is in Affinity, it would be a great application for creating 2D as well. Add a timeline and X-sheet and some tweeting-feature and you're already a long way towards it. Mr. Hildonen, thought I would come back to this thread and update you. The open source drawing/painting software known as Krita has a new beta in which they have now included an animation module. This module works on the concept of drawn animation so there is no automated in-betweening (or "tweening") in it. I didn't know if such a package would interest you but I figured I would post it on this forum in case it serves someone else who may be looking for an answer. Hope this helps. Krita beta looks like a decent start. There is also this Tumult Hype 3 app for animations. Works pretty nicely. Did you try that one?